By Alexis Leon, McGraw-Hill Education (India) Ltd., 2007. 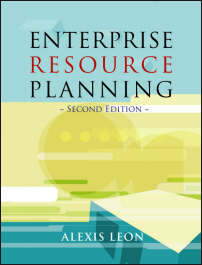 This is a book about Enterprise Resource Planning (ERP) systems. It is also about how a business works and how information systems fit into business operations. ERP systems integrate all departments and functions across a company onto a single computer system that can serve the entire organization. This real time data integration and sharing throughout the company’s functional areas increases the efficiency of operations and helps managers to make better decisions. Today, the power of ERP systems are augmented by a host of technologies like business intelligence (BI), e-business and e-commerce, business process reengineering (BPR), data warehousing, data mining, on-line analytical processing (OLAP), product life cycle management (PLM), supply chain management (SCM), customer relationship management (CRM), etc. The second edition completely revises and updates the existing edition. The book has been revised to include the latest developments in the field of ERP and information technology like popularity of Internet and WWW, emergence of new technologies, changes in the market dynamics and so on. In short the book has been updated and revised to reflect the current state and enlarged to make it more comprehensive. This book delves on the evolution, implementation, and advantages of ERP systems. The book is divided into five sections—Introduction, ERP Marketplace and Functional Modules, ERP Implementation, Present and Future of ERP and Appendices. This book is mainly for students and beginners. This book is flexible and can be used to suit an instructor’s needs and student population. This book or selected chapters could be used for a 2–3 week ERP workshop for employees, graduate students of management, computing or information technology. The book could also be used in MBA or MCA courses as an introduction to ERP systems. This book could also serve as an introductory text in a course devoted wholly to ERP. Since this book is written mainly for students and beginners, it contains a lot of pedagogical features including review questions (short answer, descriptive and essay questions), objective questions (true or false, fill in the blanks and multiple choice) and case studies. To further improve the usefulness of the book, a learning guide for students and teaching aids for instructors are available at the companion Web site of the book.